Status: offline Quite impressive. That ought to get a couple more big-dollar customers. Status: offline Will the LOS tool make it to the public version or will it remain Pro-exclusive? Will the LOS tool make it to the public version or will it remain Pro-exclusive? Status: offline Tac view real-time integration is planned for public release! Status: offline Awesome news! You know I'm hungry for that LOS tool! Maybe make it a DLC for standard version??? Tac view real-time integration is planned for public release! Do we already have any release date for the civilian tacview support? Status: offline Eh? If we bought on day one...we won't get Jamming/Comm features without upgrading?? Eh? If we bought on day one...we won't get Jamming/Comm features without upgrading?? 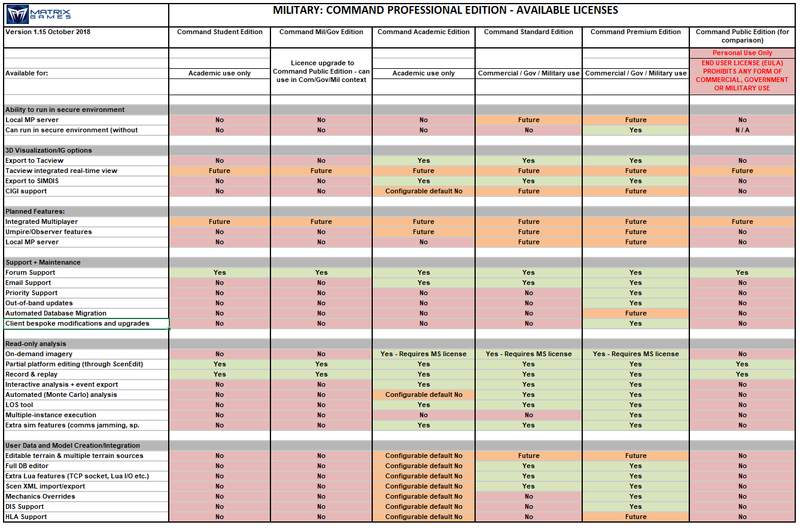 It is not about upgrading really- the others listed are versions of the simulator not available to the public. Status: offline Ahh I misread the chart, I thought it appeared that a Premium version was to be released to the public.